A happier time for Bernie and Bernadette Skeleton. 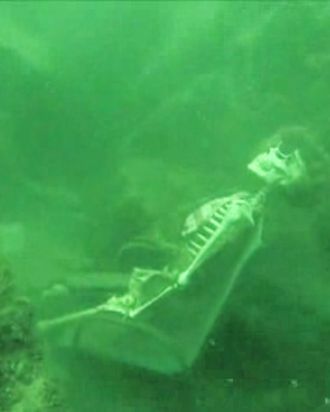 At some point this month, residents of Parker, Arizona, realized the flamboyantly attired fake skeletons that gave their town a dose of national attention this spring after they were found relaxing at the bottom of the Colorado River had found a new place to chill: the balcony of someone’s house. Shortly after the gossip about who relocated the town’s most famous residents began, local Martin Sholl dumped a complete manifesto into the comment section of a story on the mystery, claiming to have taken the skeletons and to have been the person who found them in the first place. He said he took Mr. and Ms. Skeleton — their friends call them “Bernie” and “Bernadette" — as revenge on the La Paz County Sheriff’s Office, which never gave him credit for finding the skeleton when discussing the case with national media outlets. "Skeleton Tea Party. it was funny," Sholl writes. "The next day when my friend called and told me that the chaos i created was on every news morning show in the country, i was shocked. It sucked when i found out they didnt mention me at all. … After all i am the one that found them and started it all. Who gets the opportunity to be in a story that goes worldwide?" The confessing commenter added that he planned on returning the skeletons and their lawn chairs to the river after Halloween. As few viral local-news stories end up back in the news months later with an unexpected revenge plot twist, it is unclear where this story might go next — and if Parker’s very own soap opera will end with the still-unknown person who planted the skeletons returning to save the day.